In the context of the 23rd World Tuberculosis Day, the Gabonese First Deputy Prime Minister, Minister of Health, of Social Welfare and National Solidarity, Mr Paul BIYOGHE MBA visited Lambaréné to get an update on the efforts to fight the disease. 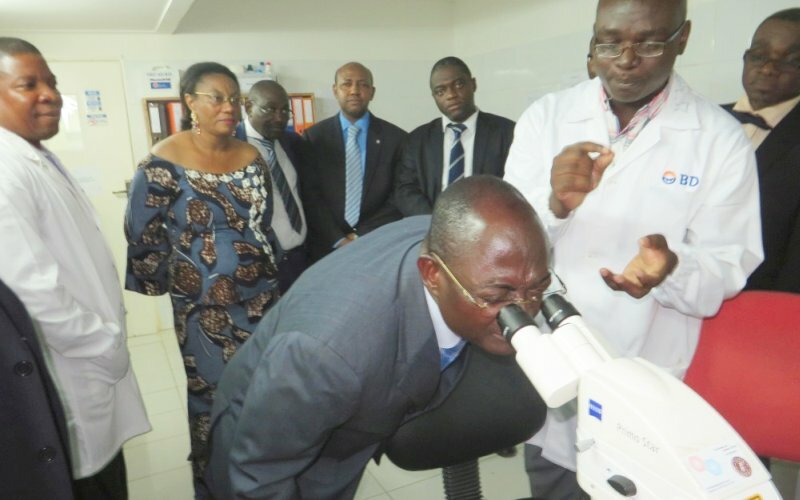 After a tour of the two hospitals in Lambaréné, the delegation, which included the representative of the World Health Organization, visited the Tuberculosis Laboratory of CERMEL. This lab has become a leading Center in the fight against TB, especially for the detection of multi-resistant strains. CERMEL is also involved in treatment of patients with multi-drug resistant TB in the Region. The minister acknowledged the important role that the research Center plays on the regional and national level and encouraged the TB group to continue their efforts.